Bilateral pitting edema is rare adverse drug reaction observed in the psychiatry department. Drug related pedal edema is most commonly seen with ACE inhibitors, non-steroidal antiinflammatory drug, and calcium channel blockers. But pitting edema with Sodium valproate is very rare. Here, we report two cases of Sodium valproate-induced bilateral pitting edema. Keywords: Pitting edema, sodium valproate, bipolar mood disorder, bilateral pitting, tablet risperidone, tablet lorazepam. Keywords:Pitting edema, sodium valproate, bipolar mood disorder, bilateral pitting, tablet risperidone, tablet lorazepam. Abstract:Bilateral pitting edema is rare adverse drug reaction observed in the psychiatry department. Drug related pedal edema is most commonly seen with ACE inhibitors, non-steroidal antiinflammatory drug, and calcium channel blockers. But pitting edema with Sodium valproate is very rare. 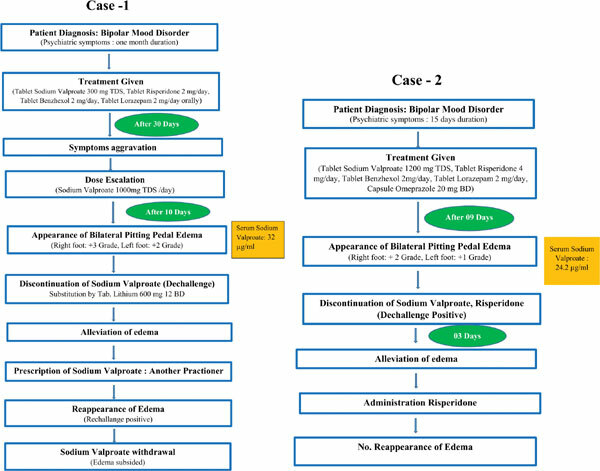 Here, we report two cases of Sodium valproate-induced bilateral pitting edema.